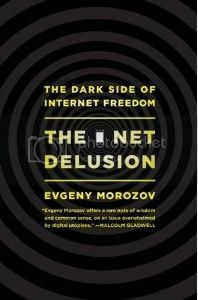 NOTE: This is the third in a series of posts reviewing the book “The Net Delusion: The Dark Side of Internet Freedom.” Here are the links to the first post and second post. About a third of the way through his book The Net Delusion, Evgeny Morozov references the Orwellian “trilogy of authoritarianism”: censorship, propaganda, and surveillance. This is a useful framework for analyzing digital repression, but Morozov only tells half the story. Unlike in his chapters on the mythology of the Iranian Twitter Revolution and the neo-con school of cyber-optimism, Morozov is in journalist mode here, rather than attack mode. His chapters on the trinity are original and empirical, yet nhe does not present the other side’s ideas. In this post I’ll review Morozov’s insights on the three pillars of digital authoritarianism and then present the other side: why there is still legitimate reason for optimism about the power of digital activists to combat these forces. Morozov begins his chapter by explaining why authoritarians might not want to censor critical blogs: they allow an opportunity to gain intelligence. Critical blogs also keep local authorities in check by allowing a higher level of criticism that both allows the central government to play defender of the people by punishing local corruption and gives the illusion of accountability. Yet censorship does is not only undertaken by governments. Many outsource the work of censorship to Internet service providers (ISPs) and web site operators, leaving the work and the cost to the private sector. Governments don’t even need to create rules for censorship. “Governments say ‘censor’ but don’t spell out what it is that needs to be censored, leaving it for the scared executives to figure it out” creating an uncertain censorship environment for activists and even encourages companies to over-censor just to be on the safe side. Governments also crowdsource digital repression by outsourcing censorship to their own citizen. In Thailand, a web site set up to collect reports of web content criticizing the royal family blocked 5,000 submitted links in the first 24 hours of operation. Yet blocking content is imperfect as more and more citizens are learning to user circumvention technology. Even when opposition web sites are hosted abroad in friendly countries, authoritarian governments have found a way to a harass and someones successfully shut them down: the distributed denial of service (DDoS) attack, which involves using software to overload a site with page requests and thus rendering it unable to serve pages to legitimate users. This is a serious but under-reported problem for digital activists around the world, and it is good that Morozov is bringing attention to it. Given repeated attacks, site operators and users become demoralized and may even get kicked off their hosting service since attacks to the site affect the sites of other clients on the same server, making them “digital refugees”. Buying extra bandwidth, the most effective response to DDoS, is prohibitively expensive to most activists. The Other Side: All these issues are real and serious, but there are ways that activists are fighting back. There are both technical and semantic censorship work-arounds. On the technical side there are anti-censorship tools like proxy servers, virtual private networks (VPN), and circumvention applications like Tor, Ultrasurf, and Freegate that allow activists and the general public to access censored contact by routing requests around blocks. In addition activists, particularly in China, are developing “semantic” work-arounds, creating alternative spellings and homonyms that allow then to discuss censored topics. The Internet police usually figure out these tricks, but they are forever playing catch-up because it is difficult to predict what alternative word activists will use and activists can choose another if one is blocked. There is even hope for victims of DDoS attacks. By making a digital home on a popular commercial platform like Facebook, Youtube, of Blogspot, activists force repressive governments into “dilemma actions”: if they block the popular platform they raise awareness of (and opposition to) censorship among the site’s apolitical users. If they try to attack the site at a network level, as Pakistan did to Youtube in 2008, they are assured international embarrassment – and that the commercial provider will be able to recover. Morozov has the sometimes amusing and sometimes merely obfuscating habit of giving his chapters and sub-sections silly titles. Sometimes they transmit the necessary information (“WWW and W” is about Bush and the web), and sometimes they just obscure the subject. Chapter five, “Hugo Chavez Would Like to Welcome You to the Spinternet,” is about online propaganda, about the use of spin on the Internet. At its most sophisticated, repressive governments use netizens as their mouthpieces, luring them with the promise of acting as agents of accountability when their true role is to pantomime that role while letting the government off the hook. Not surprisingly, the best example comes from China where a young man died in prison apparently by hitting his head while playing “elude the cat” (Chinese for hide-and-go-seek). This audacious and ridiculous lie set the Internet on fire and the Chinese government asked a committee of netizens to investigate – except they were all current or former employees of state media and their report was “inconclusive.” Apparently the government was too afraid of actual netizens to use them this time, but they might in the future. Morozov then notes how governments are countering critical content with their own interpretations rather than censoring it outright, knowing that a ban can actually increase interest in whatever is forbidden (the Streisand Effect). For example, following the 2008 war with Georgia, Konstantin Rykov, one of the Kremlin’s favorite digital propagandists, created of an online documentary-style video called “08.08.08: The War of Treason” that “portrayed the Georgians in the worst possible light imaginable”. It was not a tough sell to Russian nationalists, but was a far easier sell than traditional ham-fisted propaganda. Morozov also mentions the thousands of paid propagandists of China’s 50 Cent Party. This chapter reviews the many sneaky ways authoritarian governments have for tracking activists online. In Vietnam, the government hid malware in a download on the site of a respected NGO which turned activists’ computers into “mini-panopticons” in which their actions were visible at all times. Malware surveillance technologies include key-stroke recorders for logging passwords (reuse means just one grants access to many accounts), face-recognition software for digital video, GPS tracking for mobile phones, and data mining (Google knows how often Russians search for “bribes,” “opposition,” and “corruption). Morozov also argues that surveillance is easier in the digital age. “The old means of doing surveillance usually began with a target and only then searched for the crimes one could ascribe to it. Today the situation is the reverse: Crimes – anti-government slogans are suspicious connected to the West – are detected first, and their perpetrators are located later.” This is a much more efficient system with fewer false positives. The Other Side: But again, the mere presence of effective surveillance does not mean authoritarians will win. Surveillance is most useful with career activists, and for them it is a real danger. What it is not so useful for is countering one-off activists who take a political action once (uploading a video of a protest) and then go back to their regular lives and the casually political who occasionally pass on a link to a banned web site or criticize a government official online but who are too numerous to take effective action against. The ease of content creation in the digital age makes this kind of semi-activism ever more likely. This problem of scale is one that Morozov himself addresses but does not resolve. He acknowledges that “there is so much data being produced online that authorities cannot possibly process and analyze all of it.” Yet the scale problem is not primarily with amount of data but the number of unhappy citizens. Practically speaking, what do you do if you work for the Kremlin and know that 1 million Moscovites Googled the word “corruption” last month or work for the Chinese government and know that 200 million citizens watched a grass-mud horse video? Knowing is important, but it does not imply that an effective response is possible. As with all these tactics, if a governments oversteps its bounds by impeding the lives of ordinary citizens it lose legitimacy and politicizes the apolitical. From there it is a slippery slope in which ever greater force is necessary to maintain control, which results in ever lower legitimacy. When a government has no legitimacy left the smallest event can trigger a revolt, as former Tunisian President Zine El Abidine Ben Ali learned a month ago when the suicide of a fruit-seller motivated dissatisfied citizens to move out into the street and demand his ouster.